Beverly G. "Red" Ferrell was born on July 22, 1915, in Durham, North Carolina. He was a first cousin of Wes and Rick Ferrell, who both enjoyed big league careers that spanned the 1920s, '30s and '40s. In all, nine members of the Ferrell family had careers in professional baseball. A right-handed hitting outfielder, Ferrell was an athletic star at Durham High School, before attending Hargrave Military Academy in Chatham, Virginia, where he received a medal for best all-round athlete and was all-southern scholastic football star in 1932 and 1933. Aged 18, Ferrell began his professional baseball career with the Baltimore Orioles of the Class AA International League. Appearing in just two games, he was assigned to the Johnstown Johnnies of the Class C Middle-Atlantic League, playing just three games before moving on to the Hartford Senators of the Class B Northeastern League, where he played 31 games and batted .259. In 1935, Ferrell joined the Class D Georgia-Florida League's Thomasville Orioles. Batting third in the line-up and playing centerfield, Ferrell had an outstanding season, leading the team in runs (83), doubles (29) and homeruns (11). He hit .300 in 115 games and was placed on the first annual all-star team of the Georgia-Florida League, in August. Ferrell was back with Thomasville in 1936, and batted .338 in 112 games, with 31 stolen bases, 14 home runs and 77 RBIs. He hit the longest home run ever seen at Thomasville, clearing the 399-foot left field fence and traveling a total distance of 450 feet from home plate. Ferrell's outstanding play caught the eye of Washington Senators' owner Clark Griffith, and he was drafted by the American League club in September. Ferrell joined the Washington Senators for spring training at Orlando, Florida, in 1937, preparing for the coming season alongside cousins Rick and Wes, and competing for an outfield position against Mel Almada, John Stone and Fred Sington. Ferrell was cut in early April and assigned to the Charlotte Hornets of the Class B Piedmont League, where he played 143 games and batted .275, with 15 home runs and 94 RBIs. Back with Charlotte in 1938, Ferrell batted .300 over 139 games and hit 14 home runs with 92 RBIs. 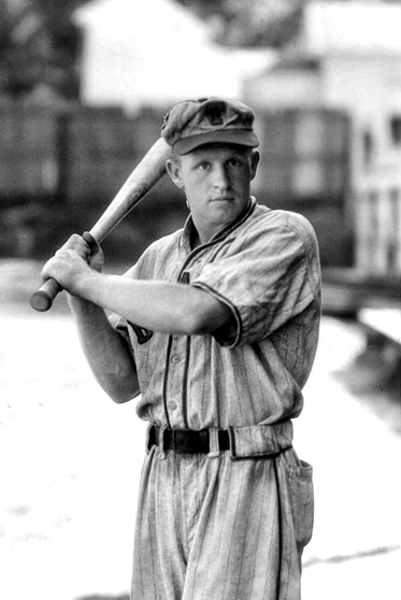 In 1939, his third season with the Hornets, Ferrell batted .299 over 133 games, contributing 17 home runs and 88 RBIs. Ferrell was on the move in 1940, joining the Greenville Spinners, the Senators affiliate in the Class B South Atlantic League, where he played 143 games, batted .278, and hit 21 home runs with 103 RBIs. He was back with Greenville in 1941, and played 63 games, batting .271 before joining the Springfield Nationals of the Class A Eastern League for 31 games, where his batting average plummeted to .204. On December 4, 1941, Ferrell was acquired from Springfield by the Class A-1 Southern Association's Atlanta Crackers, and was expected to be optioned to the Class B South Atlantic League's Savannah Indians. However, one week later, the Japanese attacked Pearl Harbor. American was at war and Beverly Ferrell didn't return to professional baseball. Ferrell entered military service at Camp Croft, South Carolina, in April 1943. Before long, Sergeant Ferrell said goodbye to his wife, Edith, and was shipped to Europe in preparation for the Normandy invasion. On August 2, 1944, Ferrell was badly wounded by shrapnel in France. He suffered injuries to his legs and was returned to the United States aboard the US Army Hospital Ship Jarrett M. Huddleston. He was initially sent to Stark General Hospital in Charleston, South Carolina, then Oliver General Hospital in Augusta, Georgia, for further treatment, before being moved to Finney General Hospital in his hometown of Thomasville, Georgia, in November 1944. By September 1945, Sergeant Ferrell had returned to service and was stationed Camp Livingston, Louisiana, when Edith gave birth to their first child, Richard. Beverly "Red" Ferrell, ballplayer, wounded veteran and recipient of the Purple Heart, passed away on December 22, 1998, in Charlottesville, Virginia. He was 83 years old.